The full image will open in a new brower window. In that window, your browser may let you zoom in to see the full resolution at 1200 pixels wide. The Historic Preservation League of Oregon, right here in Portland, asked me to make an infographic about their latest Endangered Places initiative. In addition to creating the visuals, I created the narrative’s outline and drafted the headlines and text. 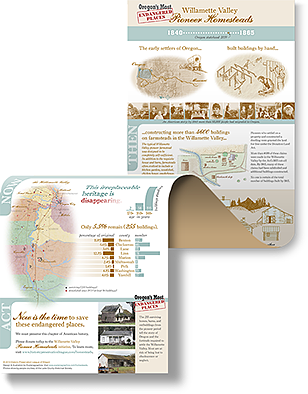 When designing this infographic, I enjoyed finding historic-looking fonts and combining illustrations, maps, photographs and charts. When I’m being precise, I’d call this an explanatory narrative with a bit of data, but these days people do use the term infographics for this kind of visuals. Want to help save Oregon’s endangered places? Visit the web site D.
Beautiful work, Nancy! Makes me want to learn more and donate to the cause, which I’m guessing were priority purposes for the piece.